I have recently finished reading an important book titled "In Defense of Dolphins: The New Moral Frontier", by Thomas I. White. White is a Professor of Philosophy who has been interested in dolphins for the last 15 years. He focuses on ethics in his teaching and writing, and applies his background in the philosophy of ethics to this book. 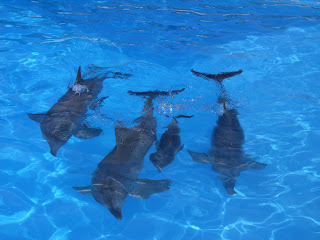 His main theme is the assertion that dolphins deserve "person-hood", to be recognised as non-human persons. To this end he gathers much of the important current research into their cognitive abilities, their emotional intelligence, their social nature, and what he repeatedly calls their "alien intelligence". I feel indebted to Prof. White for this book. He has done us all a great service. However, I think my indebtedness to him might be of a nature he does not expect. This book has many merits. It stands tall as a resource for the building movement toward recognition of the rights of dolphins. 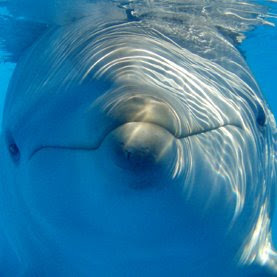 Professor White has done his research well, with many of the most current research projects into dolphin cognition reviewed. Here is where my views on this book might be surprising to Dr. White: I believe that this work will engage me for some time to come, as it will no doubt be used by many to continue the fight for the end of the dolphin-human connection. It reveals the strategy of those who would end or seriously impede our growing, and vitally important, relationship with the People of the Sea. At present I can only skim the issues that are found in this important book. I find it to be deeply flawed. Not only incomplete, but flawed by its incompleteness. He avoids, overlooks, and ignores important aspects of the story. Granted, the histories and sciences and traditions and philosophies and religions and vast storehouse of human experiences is a lot to take on, but they must if we are to have a full understanding of dolphins and our relationship to them. There is misdirection in this book, and it appears to be intentional. Very troubling is his abuse of the trust he has created in his readers once he attempts to reach his previously hidden, ultimate goal -- the abolition of all human-managed facilities where dolphins live. The misuse of the goodwill and trust he has created in the first part of the book, where he builds his careful case for person-hood, is apparent when he dives into his weird conclusions at the end, moving from one paragraph in which he says something is speculative, to the next paragraph where the same thing is now fact. He does this several times. White uses heavily loaded words in his concluding chapters, in a distinct contrast to his earlier, more balanced word choices. It is a subtle trick as he pursues his goal, as he shades carefully from reasoned argument into biased, emotion-laden rhetoric. He skips a lot of important information at the end, dismissing Dolphin-Assisted Therapy (DAT) in the same two pages with military uses of dolphins. He has clearly never seen a DAT session and knows next to nothing about it. By putting it in the same subchapter with military uses of dolphins, he vilifies it by association. His incompleteness includes an apparent lack of interest in, reporting on, or simple knowledge of anything but philosophy and science. His ethics does not include any metaphysics, which I find very odd indeed. Nowhere does he mention one word of any of the spiritual dimensions of the beingness of dolphins. He exhibits the "standard disregard" for the hidden side of life, the feelings and spiritual aspects, which is all the more odd when one reads his many pages about the emotive, affective, feeling-aware dolphins. White is woefully ignorant of history, it seems. He states that our relationship with dolphins has existed for two thousand years. How very odd that he overlooks both indigenous wisdom and traditions, the very available record of over 15,000 years of contact and relationship with dolphins. If a researcher is willing to add mythology and pre-history, we can extend that time to over 50,000 years. This is telling, as he clearly has only looked at a few of the many dimensions of our important relationship with dolphins. He also does not address other important aspects of his argument: what about the "moral standing" of elephants, who are proven to be self-aware by the same tests he extols when applied to dolphins? Do elephants have the same degree of moral standing, thus person-hood, as dolphins? He decries the description of dolphins as objects, as items of ownership, as anything less than beings deserving high status alongside humans, and uses examples of how we should treat them by making it out that we can deny careful consideration for all other "animals". He seems to accept abuse of all animals-- captivity, raising them for food, doing research upon them, hunting them -- but not dolphins. After chapters and chapters making a case that we must not anthropomorphise them, he sets about doing that very thing, over and over, during his concluding remarks. He assumes to know their thoughts, levels of contentedness, and mental agility, by using human-value-based projections upon observed behaviours. Oddly, he says it is hard to make a case against captivity, then attempts to do so, and fails. He says that nearly all research into dolphins-- their intelligence, health, physical systems, self-awareness, and more -- were done - necessarily - in captive environments, and that this now has no place and must end. He implies that there is nothing left to learn about dolphins that we cannot learn at sea. I am reminded of the man who resigned from the US Patent Office in the early 1900s because he was convinced there was nothing left to invent. He suggests that dolphins in facilities be "allowed to die out over the next 40-50 years". He does not address the need for decent social interaction, which demands that dolphins be in mixed-gender groups for healthy lives, which produces more dolphins. Does he condone, as Ric O'Barry insists upon, the force-feeding of contraceptive drugs to dolphins? It would seem so. White recognises the failures of attempted release of formerly managed dolphins, so he does not advocate their summary dumping into the sea, which is to his credit, but he does advocate killing them all off by a sort of benign neglect -- and in doing so, going diametrically against his entire main argument for a decent regard for their "persons". He is hypocritical on this issue. It is clear that White wants to end captivity. He sets out to arrive at that destination, and his first chapters do an admirable job of building a case for much better appreciation of dolphins-- their lives, intelligence, self-awareness, cognitive abilities, and more. But when he gets close to his objective, his arguments suddenly become fact-free, emotive, subjective, and ultimately corrupted by twisted logic, making many of the same errors of fact and logic that he attacked earlier in others. All in all, his book is very important and will add fuel to many fires. He will be championed by the "Lori Marino camp" (he makes her out to be a major heroine on the dolphin scene, citing her repeatedly). He has also done the Dolphin Embassy a great favour, not only by building a very good case for person-hood, for the Cetacean Nation objective, but he has also clearly demonstrated and outlined the deep flaws in the arguments against DAT and our ever-improving, and critically important, relationship with dolphins.